A solid commuter with the heart a sports car, the 2014 Honda Civic Coupe remains a favorite with drivers around the Middletown and Mechanicstown areas. Smart design and fuel efficiency have helped to distinguish the Civic in the past, and these qualities stay strong for the 2014 model year. The 2014 Kia Forte is a similarly styled, similarly priced coupe alternative to the Civic. Which one is the better buy? This efficiency is compared with 2.0L Kia Forte Koup models, which average about 25 mpg city and 34 mpg highway. Once again, the Civic Coupe has been chosen by the Insurance Institute for Highway Safety, one of the nation’s leaders in vehicle testing, as a Top Safety Pick. The Civic earned top marks in all categories tested, including the difficult small front overlap crash test, one of a few select vehicles. The 2014 Kia Forte Koup also received a Top Safety Pick award, but scored a “poor” rating in the small overlap crash test. Interested in seeing what else the Civic Coupe has to offer? We encourage you to stop by Middletown Honda, get behind the wheel, and take it out for a spin. We’re located at 520 Route 211 in Middletown, a short drive from Mechanicstown and many other OrangeCounty communities. 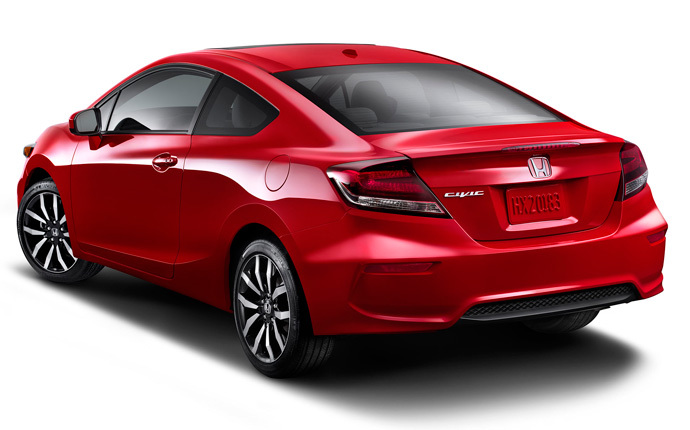 Got questions about the Civic Coupe? Please feel free to contact our sales team. * 29 city/38 highway/33 combined mpg rating for CVT models with paddle shifters. Based on 2014 EPA mileage ratings. Use for comparison purposes only. Your mileage will vary depending on how you drive and maintain your vehicle.